Harga Motor Yamaha RX King here is the average price of the Big City Like: Jakarta, Bandung, Medan, Surabaya, Semarang, Makassar, Denpasar from various stores and Dealer standard. This RX King motor is the original plan of R & D Yamaha Indonesia and not produced in another country. Coating to make them user friendly motor, convenience and energetic. With engine 2-tak 135 cc, this bike has solid handling, responsive power, quick acceleration, but still nice to use in a slow speed, alias the round under is also powerful. 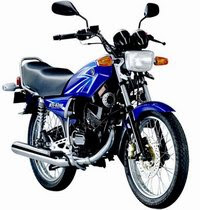 As it is known that the motor is a derivative of Yamaha RX Series, first time this came out in 1983 and ended in 2009, 26 years is a long time for a motorcycle. This “King” already win a lot of biker’s hearth.